As a passionate reader of good literature I already had the chance, along the decades, to be delighted with amazing books describing chapters from ancient mythology and history followed by famous classical to modern authors up to nowadays epics, covering almost any domain of interest. 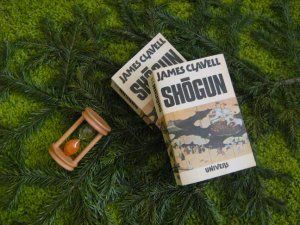 So, about 25 years ago, when it happened to find “Shogun” James Clavell's novel, I thought it would be just an average lecture coming from across the ocean… but I was wrong! From the very first row read, I was thrilled about author’s captivating writing and perfect mise-en-scene, and James Clavell’s bestseller, “Shogun”, made such a strong impact to me that remain into my mind as one of the best fiction books that I ever read! This year, after leafing few so said bestsellers issued lately, so poorly done but very well advertised, I couldn’t resist and felt the strong desire to re-read this wonderful novel once again. First time when I read it, years ago, I was very excited to know what’s happening next, feeling like I’m a sponge ready to absorb every single information and thought coming from Clavell’s rows, being so impressed with each detail, place, historical event or Japanese traditions (even if they might occurred some errors), geographical description, new character coming into the scene and her/ his complex behavior. At that time I was in rush to find out more and more and reach to the end, which was somehow a loss for skipping essential aspects and omitting to enjoy such a good reading. Now, while already knowing the content and the end of the story, I read it at my own peace, thoroughly without skipping a line, taking the time and having the luxury to really enjoy the reading page after page, row after row, thinking about what else it might be behind, what else the author wished to present to the reader, let the imagination free creating the illusion that I’m taking part of the action, as well. Such an amazing feeling that so rarely one author can transfer it to you, the “thirsty” reader. Please, make a favor to yourself and do NOT watch the poor movie made after this book and DO READ this book for the simple pleasure of a wonderful reading and enjoy learning about other civilizations presented to us from a different perspective in such a captivating manner! James Clavell - The Fly (1958) – Have you seen the movie? Hmm, quite a triggering idea! James Clavell quote about Truth - "The search for the truth is the most important work in the whole world, and the most dangerous." James Clavell quote about Intelligence - "God gives us intelligence to uncover the wonders of nature. Without the gift, nothing is possible." Cliff Fadiman - "When you reread a classic, you do not see more in the book than you did before; you see more in you than there was before".